Because (after a DUI arrest) you may need to file your 10 day letter to Georgia DDS to protect your right to drive if your driver license was confiscated by police, getting great legal advice is important. This also helps you learn more about your Marietta arrest. So, to protect your legal rights and preserve favorable DUI evidence, call for FREE advice from a Marietta DUI lawyer who is familiar with the Cobb County criminal court system, the law enforcement community in Cobb County, Georgia, and all aspects of criminal law. Quick action in a criminal case is your best chance at obtaining a great outcome for any alcohol-related or drug-related criminal case, felony or misdemeanor. Mr. Head can also help you with other criminal charges in Cobb County. At this first appearance before a Marietta judge, you or your criminal defense lawyer acting on your behalf are required to appear in court, enter a plea of guilty, not guilty, or no contest (nolo contendere). At the first appearance, our DUI lawyers will enter a not guilty plea for you, and request discovery from the Prosecutor, which usually includes the DUI video, police report and other information. The choice is always yours, but if you plead guilty as charged at arraignment or any other time — even to a first offense DUI — you will create a permanent criminal record that cannot be expunged, and will immediately face very stiff Georgia DUI penalties, including possible additional jail time, driver’s license suspension, be required to perform hours of community service, go to and pay for DUI school, be evaluated for alcohol and drug dependency or addiction, and pay court fines and surcharges. Additionally, if convicted of DUI Georgia, mandatory probation will be imposed, and monthly supervision fees must be paid. Remember that a DUI conviction is forever, since Georgia DUI laws have no DUI expungement law. What Is a GA Municipal Court? Municipal courts in GA process a large number of misdemeanor criminal law cases, traffic ticket cases, and some other local ordinance matters. All municipal courts are non-jury courts that appoint a judge and prosecutor to oversee misdemeanor traffic offense cases, including DUI, simple possession of marijuana, speeding, failure to maintain lane, reckless driving and all other motor vehicle crimes that are not felonies. This “filtration system” provided by municipal courts in our State relieves the Superior Court (in smaller population counties) and the State Court (in larger population counties) from clogging their calendars with misdemeanor DUI cases that do not need to have a JURY TRIAL. Plus, the revenue from case dispositions in a municipal court stays IN THE CITY, versus going to the State or County. Marietta Municipal Court is a court of limited jurisdiction, for misdemeanor traffic ticket cases, and municipal ordinances. Plus, other common non-driving misdemeanors such as possession of marijuana (less than an ounce) cases can be resolved in this Marietta criminal court. The Marietta Court conducts non-jury trials, negotiates and processes guilty or nolo contendre pleas, and imposes sentencing. If your drunk driving arrest occurred outside the Marietta city limits, and you were pulled over by a Cobb County police officer or the Georgia State Patrol, your case will be heard in Cobb County State Court. It is located on the Marietta Square about 500 yards from Marietta Municipal Court. The Cobb County State Court is a jury court, and adjudicates all municipal court transfers in Cobb County from cases involving Marietta Municipal Court. Likewise, all other municipal courts in Cobb County GA operate with the same limited, non-jury misdemeanor jurisdiction, including Smyrna Municipal Court, Acworth Municipal, Austell Municipal Ct, Kennesaw Municipal Court, Powder Springs Municipal Court, and Mableton Municipal Court. Different prosecutors and judges covers these courts, and our DUI defense lawyers know which ones are willing to negotiate DUI cases. Felony DUI cases, for example in cases that involve injuries or death, DUI fourth offense, or DUI accidents with serious bodily injury or death, are heard in Cobb County Superior Court. Your Cobb County DUI lawyer should have years of criminal defense experience in both Cobb Superior Court and Cobb State Court, as well as with your Cobb municipal court. Experience and relationships are key, so that he or she can successfully represent you in any of these city courts located in Cobb County, GA.
Who Works for the Marietta Court As Judge and Prosecutor? Chief Judge Roger J. Rozen is the chief judge of this court. Judge Rozen previously served as Solicitor (Prosecutor) for the Municipal Court from 1982 until his appointment as Chief Judge in 1983. The Marietta Municipal Court prosecutor is Robert Donovan, who was appointed as the Prosecutor in 1986. Under Georgia laws, a misdemeanor prosecutor is called a “solicitor.” In addition to Mr. Donovan, five part-time Assistant Prosecutors are available to assist the Prosecutor on DUI cases or other misdemeanor offenses, including traffic tickets, like speeding. The assistant solicitors will fill in for Mr. Donovan when he is unavailable for the regularly-scheduled Marietta Municipal Court calendar. Acting on behalf of the Marietta police department officers or Georgia State Patrol officers who issued a traffic ticket or made a DUI arrest, Mr. Donovan and his prosecution team will investigate your misdemeanor DUI charges (or other criminal offense), conduct a criminal record check on you, review any breathalyzer test, taken after arrest that shows BAC levels, or investigate any blood test results (for DUI drugs or DUI-alcohol, or both) from the GBI. Additionally, the police report and DUI arrest video will be reviewed by the Marietta Solicitor. This will show your manifestations of intoxication, as well as any field sobriety test performance. In some cases, like a DUI accident case, the Prosecutor will interview witnesses, and debrief police officers involved in your DUI arrest, booking or breath alcohol test. Once this DUI case review process is concluded, he or she will recommend a negotiated plea “offer” to your Marietta DUI attorney, and recommend fine amounts. First, after being hired, our experienced criminal defense attorneys will file many motions on your behalf. We will take care of any implied consent law issues with your Georgia driver’s license, if the case is a DUI. One common type of criminal law pleading our DUI defense lawyers routinely file for our Marietta clients is a discovery motion, when your criminal attorney requests copies of all evidentiary material contained in the Prosecutor’s file. Additionally, where a breathalyzer test was taken, or an HGN eye test was done incorrectly, we file a motion to suppress DUI evidence that was improperly performed, or had defective field sobriety test instructions, or illegally obtained from our client. Serious traffic offenses, like DUI are generally not allowed to be handled without the client being present in court. On less serious offenses, this case be done via a plea in absentia, or a plea with our client being absent. This method of disposition is helpful if our client lives out of state, or a good distance from the Marietta Court. If we can get the DUI reduced to reckless driving, most municipal court judges will allow this to be done in absentia, but not a driving under the influence case. The Marietta Municipal Court is only authorized to conduct non-jury trials. Non-jury trials are known in the legal industry as a “bench trial,” meaning that the person occupying the “bench” (the judge) decides guilt or innocence. Any person facing criminal charges in the Marietta court can demand a trial by jury, and the criminal case is then bound over to Cobb County State Court, which is on the Marietta Square, less than 500 yards from the Municipal Court of Marietta. Under Georgia law, only two courts that conduct jury trials, and these are the State Courts and Superior Courts within Georgia. If your case proceeds to a jury trial, your case will be moved to the State Court of Cobb County, on any DUI misdemeanor or other traffic offense. Any felony charge, such as a serious injury by vehicle GA case goes to the Cobb County Superior Court, located about 150 yards east of the Square in Marietta, with a fairly new building. The City of Marietta Municipal Court location is in Downtown Marietta, Georgia. Limited free parking spaces are located near the Marietta Municipal Court building. However, it is advisable to arrive early to find a free space. A short distance from the popular Marietta Square, the Municipal Court of Marietta is located at 240 Lemon Street, Marietta, GA 30060. From the Cobb County State Court Building (adjacent to the “Strand Theater”) to the Municipal Court is about the distance of five football fields, or 500 yards. The court entrance is off Lemon Street, northeast of the Square, and is the street is marked “Keith School Lane NE”. On older maps, this street was called “Dobbs Street,” and it was eventually closed and renamed over 10 years ago when the City of Marietta outgrew its old building at 205 Lawrence Street, Marietta, GA. The new Municipal Court now shares its building with the Marietta Police Department. Before this, Municipal Court of Marietta cases used the City Council chambers for its court proceedings. As with the old Marietta court location, parking spaces are limited, but pay lots can be found just a block west or south of the Marietta Courthouse. To find good food, you will need to go back to the Marietta Square restaurants. Since functions were consolidated, the Marietta police department headquarters is housed in the majority of interior space of this Marietta Court building, including the basement level and across the lobby from the Marietta Municipal court entrance. The telephone phone number of Municipal Court of Marietta GA is (770) 794-5400. Every Cobb County DUI lawyer in our DUI law firm, will gladly appear with you in the Municipal Court of Marietta. Partner Cory Yager is a former Cobb County Police officer, and has long-lasting connections to every level of the Cobb County law enforcement community. Cobb County Bar member and Senior Partner Bubba Head, criminal attorney Marietta GA, is a Life Member of the Georgia Association of Criminal Defense Lawyers and the National Association of Criminal Defense Lawyers, for over two decades. For most court dates our DUI attorneys can attend in your place. That means that you do not have to appear in court, since we act in your place. On your first court date, which is called the arraignment, unless your criminal defense attorney tells you to be at the DUI arraignment. Over 90% of all Marietta GA traffic tickets appearing at Marietta traffic court are written by Marietta police. All Georgia DUI arrests originate as a traffic ticket. The other 10% of arrests are Marietta traffic citations written by members of the Georgia State Patrol, or GSP. Many GSP motor vehicle tickets in GA occur on one of the interstate highways passing through Cobb County (I-75, I-675 or I-285). Most tickets on an interstate highway in Cobb County are not issued within the City of Marietta, but some DUI charges are written within Marietta city limits. Due to the massive amount of traffic passing through Cobb County each day, some DUI felony cases will result from an investigation of a DUI accident with serious bodily injuries, or a DUI fatality. Georgia is one of several states (mostly in the Southern States) that have local, inferior courts that process their own traffic tickets. 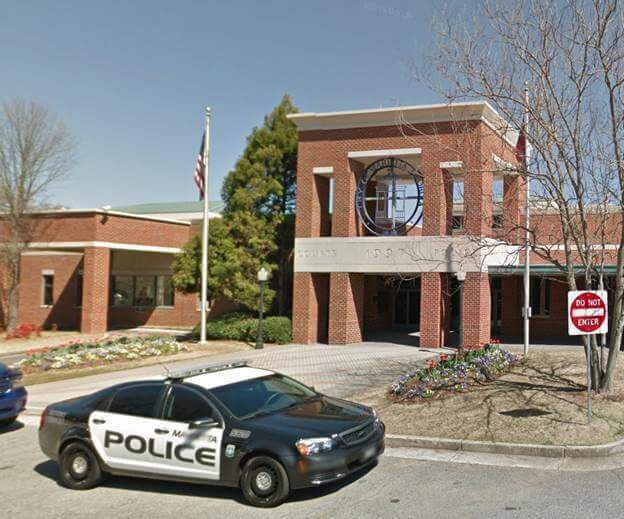 The local municipality also operates its own police force, and pays their own police officers who can investigate crimes that occur in Marietta, GA. These officers also issue traffic tickets. The crimes that Marietta police investigate include felonies, misdemeanors, and local ordinance violations. Municipal courts cannot empanel any jurors, because they are non-jury courts that have limited jurisdiction. Any misdemeanor criminal case pending in the Marietta Municipal Court will be for a misdemeanor criminal arrest, or after issuance of a traffic citation, or for a misdemeanor. These cases will be opened for an arrest or traffic ticket made within Marietta city limits. Any felony DUI case investigated by Marietta police will be handled by the Cobb County Superior Court, whether the crime occurred in a motor vehicle (e.g., DUI fourth offense, vehicular homicide, or serious injury by vehicle), or whether it was another offense (e.g., murder, drug trafficking, felony assault). If a DUI felony is accused, you may have a bond set by a Cobb Magistrate judge, and your case will be handled by the Cobb County District Attorney. If you had a felony arrest and lost your paperwork, and are trying to determine what county Marietta is in, the answer is Cobb County. People facing a Georgia DUI get confused about the many courts in Georgia. No state has more courts that process DUI arrests than the State of Georgia. We have over 1,000 different courts that may be the criminal court overseeing your DUI case. In Cobb County alone, over 10 different courts may have some involvement with a DUI case. This number does not include the Administration License Suspension Court associated with OSAH (Office of State Administrative Hearings), which adjudicates implied consent law “refusal” cases or “over the limit” cases that are parallel proceedings to the pending criminal case. In most cities, a municipal court is a part-time position for both the judge and the prosecutor (solicitor). Marietta Municipal Court follows this pattern. Both the judge and solicitor are private attorneys in Marietta, but hold these positions with the City of Marietta with the approval of the Mayor and City Council. When either of them has to be out for vacation or other reasons, an assistant judge or assistant prosecutor will fill in for whichever one is unavailable. However, the cases have all been reviewed by the solicitor, Robert Donovan, and his notes are placed in each file. State Court of Cobb County GA is a full-time court with many judges, and many prosecutors. This court is in session every day, and handles both misdemeanor criminal cases as well as a few limited types of civil litigation cases. The most common trial in the criminal division is DUI. The most common trial in the civil division is civil litigation cases for money damages, such as car accident cases or medical malpractice cases. For such civil cases, the State Courts in Georgia have unlimited subject matter jurisdiction, as far as the dollar amount awarded. While DUI cases that originate from a Marietta, GA ticket start off in Marietta Municipal Court, the accused citizen has a constitutional right to trial by jury. Therefore, his or her criminal case can be bound over immediately or later, after attempts to negotiate a favorable plea are made in the Municipal Court of Marietta. No case from outside the Marietta city limits can be brought to the City of Marietta Court – only misdemeanors occurring within the city boundaries. So, cases bound over (moved) from Marietta Municipal Court will be a fraction of the total caseload in Cobb County State Court. Most lawyers in Marietta, GA will handle criminal cases in any of the seven Municipal Courts, or from the unincorporated areas of Cobb County. We recommend that you hire a criminal defense lawyer from our DUI law firm for any arrest in Cobb County, GA.
GA DDS hearings for all Cobb County DUI arrests are held monthly at Marietta Municipal Court with an OSAH judge presiding. Each month, all OSAH hearings are conducted at the Marietta Courthouse in Marietta. This same courtroom is utilized for all administrative hearings, including driver’s license suspension hearings for drivers arrested for DUI. So, 240 Lemon Street, Marietta, GA will be the address found on OSAH court notices for all Cobb County administrative hearings. The Georgia Department of Driver Services office for Marietta GA license issuance or driver testing is not at this Marietta traffic court location, however.